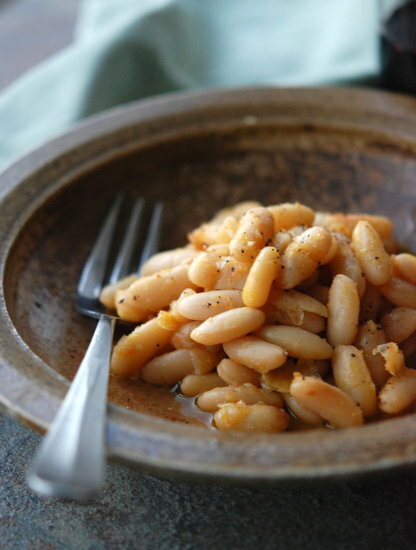 These may look like ordinary white beans but they’re actually the cool-girl beans in town, swooned over on Twitter, gossiped about on Facebook, photographed and copied and seriously in demand. I’d love to take credit for the fabulous recipe but no, these are via Chef Adam Vickerman of Cafe Levain, who now has the lady food bloggers in town batting their eyelashes over beans. The flirtation began last spring, at a California Olive Ranch-sponsored dinner at Levain. As the beans were served, an audible murmur went through the room as the ladies realized that the delicious dish was not only vegetarian but vegan. I myself was inspired and without asking Adam for his recipe, made my own version of braised beans with rosemary and arugula when I wrote about the event. When word got around that Adam was cooking for our lady food blogger gathering in December, requests showered in for the beans! And so he obliged, and then shared the recipe, which is beautifully simple and a perfect example of how coaxing maximum flavor from a few good ingredients is how we should all be cooking. Add the carrot, celery, and olive oil to the bowl of a food processor and puree. Heat a Dutch oven or other large pot—the widest you have, it helps the beans cook evenly—over medium heat. Add the carrot mixture, diced onion, and soaked/drained beans to the pan. Saute the mixture together, stirring every once in awhile, until the beans are nicely caramelized (don’t rush this process, it’s what gives the dish its flavor and depth). Stir 1/2 gallon of water into the beans and simmer over low heat until the beans are glazed and as tender as you like them. To serve, stir in a generous amount of mustard and salt & pepper to taste. Note: The lovely bowl in the photo was made by Fred Yerich of Frogtown Pottery. The fork I snagged – with permission, of course! – from Corner Table. Hi Fuzzles! Agree about Adam! Any brand you like the taste of on its own works beautifully. Even Grey Poupon if you like. VERY flexible. What brand of mustard did you use? I'm thinking that Byerly's (store brand) sweet and spicy grainy mustard would fit awesomely here! In these parts, if an Adam Vickerman recipe is given, you MAKE IT! :drool: Can't wait to taste this!